These volleyball sayings are build on positivity. The power of positive self-talk is evident through them. 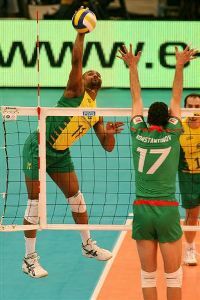 How to Build Condidence in Volleyball? We have gathered these motivational commands and phrases from audio recording about athlete’s mental preparation, which was given us by our athlete friend. One day he finally released the secret of endless tournament wins and his winning mind by telling about his mental training exercises and self development tapes. It is recommended for athlete to listen audios to make your mind more powerful. Reading and repeating these quotes as positive self talk will also work to your advantage. Volleyball Sayings - How to Use Positive Self Talk for Self Development? Repeat these phrases often, read the quote slowly three times before proceeding to the next one. They will give you a positive self believe and motivation - and keep negative thoughts away. How to become a self-confident volleyball player? “My potential is great - I compete with the confidence of the champion… point after point…. game after game." How to get encourage to perform? P.S. We do not know the origin of these motivational volleyball quotes; the creator is unknown. If anybody knows this unknown source, please let us know so we can give credit to the creator of these powerful phrases.